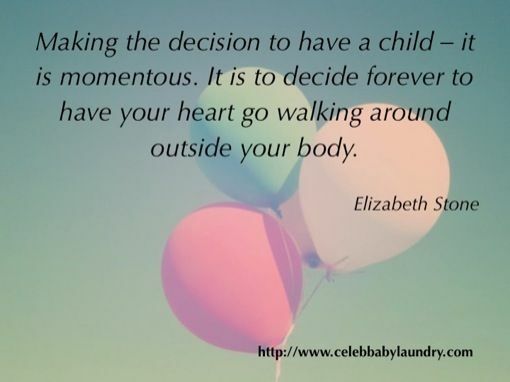 Before I got pregnant and even in the first few weeks of pregnancy, I thought I understood what it felt like to already love my baby. I knew no matter what it looked like, no matter the gender, I knew I would love him or her more than anything. And I thought I already did! 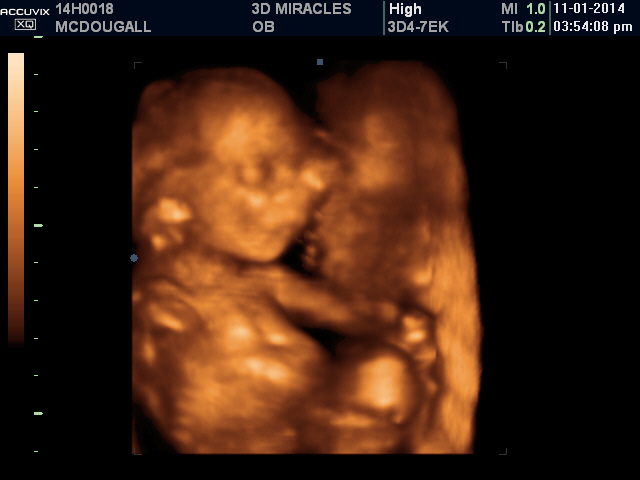 Over the weekend we had our 3D ultrasound at 3D Miracles in Halifax. Nothing can really prepare you for the explosion of emotion one feels when that ultrasound thingy slides across your tummy for the first time, revealing your little baby that you’ve been carefully nurturing and protecting for 5 months. We haven’t had any ultrasounds during the pregnancy so this was the first time seeing the little baby. I had googled 3D ultrasounds to see what kind of detail we’d see and look at pictures of other babies but I was completely blown away when I saw baby MOVING! It was the most surreal experience the two of us have ever had. And oh my god, it’s a boy! My tiny little baby boy was moving his head and arms and little legs. We even got to see him PEE! Though I haven’t really been able to feel major kicks yet, I know he’s moving around but to SEE him move around…WOW! Talk about instantly falling in love. There was nothing better than watching my husband watch his tiny little son — it was so moving! I was fully prepared for a girl or a boy! We knew we just wanted a baby and gender wasn’t a big deal at all. Of course as a woman, I’d always dreamed of dressing a tiny little girl in dresses and doing her hair but to be completely honest, I couldn’t be happier to have a little miniature version of my husband! We’ve already got plans to get him mini Sperry Topsiders just like his daddy! One of the most exciting things about having a little boy is raising him to be the kind of man I would want my daughter to marry — respectful, kind, and loving. Just like his father! For most of the pregnancy, I’ve just been going about my business while my body carries out the extraordinary task of creating life. I definatly forget just how amazing it all really is and to have that glimpse inside my body and see that everything is just fine and dandy and there’s a little baby boy just in there kickin’ it was the greatest reminder of how incredible my body (and every other female body) really is. It’s nice to know all the nausea, back aches, and sleepless nights are all just a tiny sacrifice for my little boo. It also does wonders to help me accept my growing and changing body. I’m now very noticeably pregnant and none of my pre-pregnancy pants fit anymore but you know what? It’s OK! I know I always knew it was all for a good reason and perfectly natural but to see that little baby boy and to know he’s doing just fine really does make it that much easier to admire my new body in the mirror. There’s a lot other women and doctors don’t tell you about pregnancy. I think if they did tell women all the gory details, no one would dare have a baby. Also the list of unpleasant body changes and emotional turmoil a woman experiences is far too long. By far the most challenging thing I’ve had to endure so far is weight gain. I’m sure it makes me sound like a terrible mom and an awful woman but the weight gain has got to be the most depressing thing on the planet. I understand it’s for a good cause, but it’s still painful. I’ve lived my whole life trying to stave off weight gain and in one fell swoop I’m supposed to just embrace my ever-expanding waistline. Within the first two months of pregnancy, I ballooned like a damn beached whale and I was getting comments like, “I’ve never seen someone show so soon” and “You must be having twins”, but then my waistline miraculously shrunk back down. After much googling, I realized it was completely normal for bloating within the first trimester and then for it to subside. 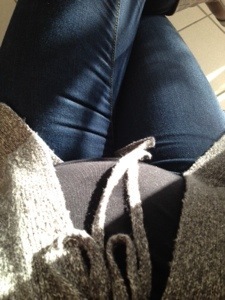 As of now though, none of my pre-pregnancy jeans fit and any tight t-shirts are insanely mid-drift barring. OH, and all my workout clothes look like sausage casings, so that makes it challenging to look at myself in the mirror at the gym. But it’s all for a good cause, right? Not to mention the fact that in 2 weeks, I’m suppose to fit into my WEDDING DRESS for our second wedding party in Cuba this Christmas. All the while my mom is in my ear about her vegan, clean-eating, challenge and all the weight she’s loosing. I told her how it must being coming off her and on to me and she lectured me about how it’s going to be hard to lose the baby weight once junior is born. 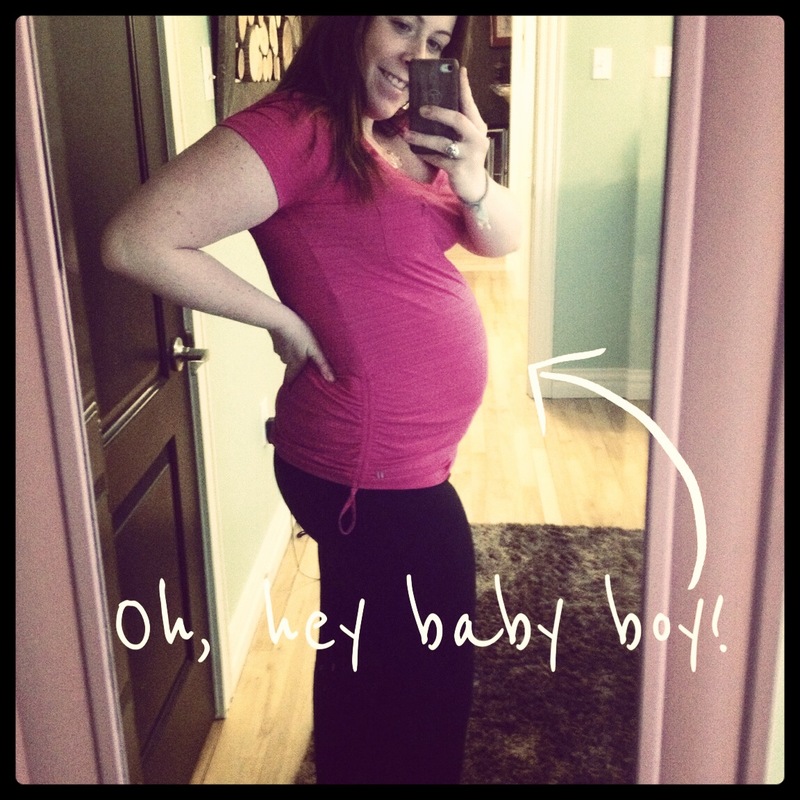 When I first began this beautiful pregnancy journey, I was constantly nauseous and couldn’t stomach being in the kitchen, eating vegetables, or eating anything other than carbs without dry heaving. Now that I’m able to stomach a wider variety of things, I’m actually doing a lot better with the weight gain and I’m starting to feel it even out a bit more and stabilize. For a few weeks there I could only stomach bagels and cream cheese, popcorn, eggs on toast, and salt and vinegar chips but now my day looks like: Eggs on toast, frozen fruit and soy milk smoothies and stir fries and veggie filled pastas. I’m still not able to stomach too much meat which is fine by me. I’m taking lots of vitamins to supplement the lack of protein in my diet. All these feelings I’ve been having have been teaching me about selflessness. This is the first time in my life I’ve been making major sacrifices for someone else. I’m very much ready for all these changes but it still doesn’t make the blow any less shocking and depressing. PS: if I didn’t make it absolutely clear, I’m very much in love with my beautiful bundle of baby love and I wouldn’t change any of this for the world. When I first found out you were leeching life off of me, you were the size of a poppy seed and now you are a plum! Your hands are now big enough to hold and your face is looking more life-like every day. I find every step of your development so fascinating. For the amount of manual labour going on inside of me, I sure don’t notice you very often. Actually, let’s be clear… The last three months I knew you were there every time I hung my head over the toilet, dry heaving away or every time I felt I was “so hungry I could puke”. But other than the odd cramp, you’re a pretty quiet house guest. Now I feel better. I feel happy and healthy again. Hurrah for the second trimester! What’s really got me excited right now is feeling those little legs and arms thrashing around. For a while it will be just between you and me. I reckon we will share a quite a few things that are just between you and me. I feel like we already have a bond. Just like I was for my mom, you little wee one are my source of inspiration. You have already made me a better person than I ever could have imagined. Baby, because I wanted you to have a happy and healthy mommy, I got help. I knew several years ago you were a not so distant dream and I wanted to heal my brain so I could soak you in and love every minute of our life together. You make me realize how precious life is….how fragile we are. I already feel like I’ve made a huge mistake as a mother. In order for me to function and not be a complete emotional wreck for these nine months, I had to continue with my medication. I’m only on .5 mg a day and my doctor says she’s delivered hundreds of babies who’s moms were on much higher doses and the baby was perfectly happy and healthy… But I can’t help but worry. Like I said, you’re so fragile. Whenever I sense a possible threat, I play my fight song in my head and get all maternal. So baby, you see I’ve weighed my options and you having a mom that can’t function is not in the cards for us. Happy moms make happy babies and I can’t wait to see your tiny little smile and hear that infectious little laugh.